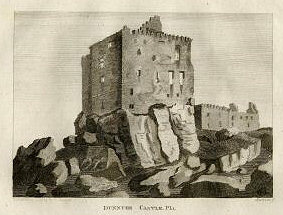 This print was published in an 1797 edition of "The Antiquities of Scotland by Francis Grose". Francis Grose (1731–1791) was an antiquary and lexicographer, of Swiss extraction. He published Antiquities of England and Wales (1773–87), which was well received, and thereafter, in 1789, set out on an antiquarian tour through Scotland, the fruit of which was Antiquity of Scotland (1789–91). He afterwards undertook a similar expedition to Ireland, but died suddenly at Dublin.